C.J. 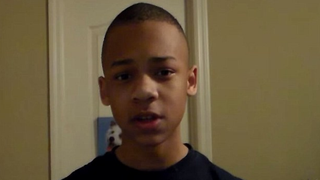 Pearson, a 12-year-old middle school student from Georgia, uploaded a video on his YouTube channel Saturday in which he blasted President Barack Obama for not really loving America, because if he did, C.J. claimed, Obama “would call ISIS what it really is—an assault on Christianity [and] an assault on America,” Pearson said. The video has garnered more than 390,000 views as of early Monday afternoon. “If you loved America, President Obama,” Pearson continued, “you wouldn’t try to take away what hardworking Americans have worked for their entire lives,” C.J. said, never clarifying what was being taken away from working Americans, but referencing a popular Republican talking point nonetheless. C.J. then tipped his hat to former New York City Mayor Rudy Giuliani for “calling [Obama] out on his downright hatred of America”: “I applaud him for his comments and definitely do hope that one day other people will get enough guts to speak out against your downright hatred for this country,” the preteen said. C.J. went on to criticize Obama’s actions on national security, saying that the president wasn’t willing to defend the nation against terrorism.